>Today we have a WINNING recipe for you so that you can WIN in your nutrition and WIN in life! 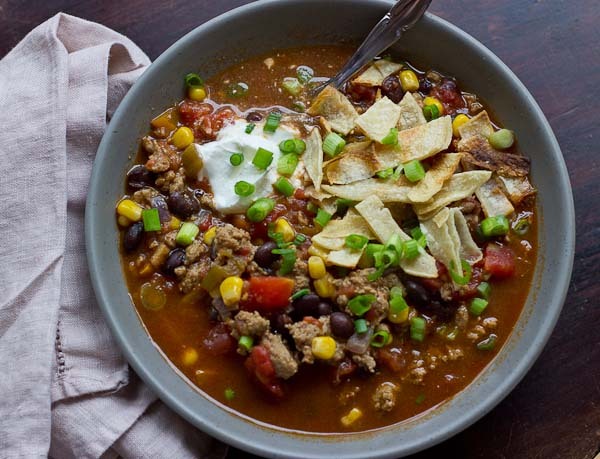 Today’s WINNING recipe to meet Coach JC’s 10 WINNING Habits is Turkey Taco Soup. Where are my veggies? Where is my lean protein? Have I earned my starchy carbs? In large pot, heat oil over medium-high heat, then add onions and garlic, and cook until softened. Stir in bell pepper, and continue to cook until softened. Add ground turkey, and cook until browned. Stir in taco seasoning, and add tomatoes, beans, corn and chilies. Bring to a boil. Reduce heat to low, and simmer until ready to eat. Ladle soup into bowls, and top with sour cream, green onions and tortilla chips if desired.